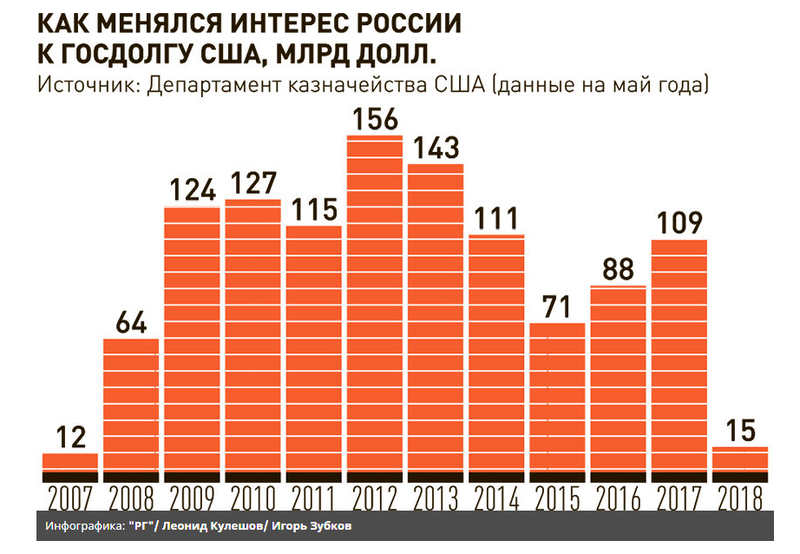 In a move labeled “unprecedented” by experts, during the run up to the Trump-Putin Helsinki summit, the Russian government has sold off the vast majority of its holdings of U.S. Treasury securities. Henceforth, Russia is no longer considered a “major foreign holder” of U.S. government securities. It’s unclear whether Presidents Trump and Putin discussed this aggressive reduction during their tête-à-tête meeting. Neither the glimpse of Putin’s notes, nor the post-summit comments reveal any mention of this topic. Russia’s move seemed to go unnoticed by the group of U.S. lawmakers that celebrated the 4th of July in Russia. 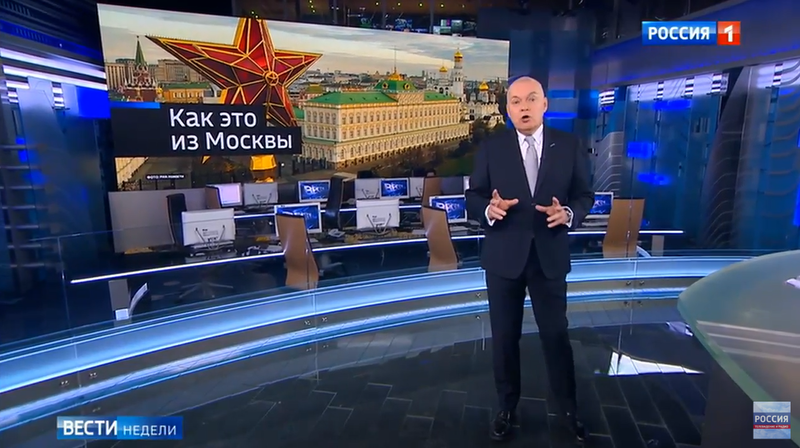 They watched the ballet “Sleeping Beauty,” toured St. Petersburg and appeared on Russian state television, refusing to call Russia the adversary of the United States. Meanwhile, between March and May of 2018, Russian holdings of Treasury securities declined by 84 percent, plummeting from $96.1 billion to the mere $14.9 billion, according to the U.S. Treasury Department report. 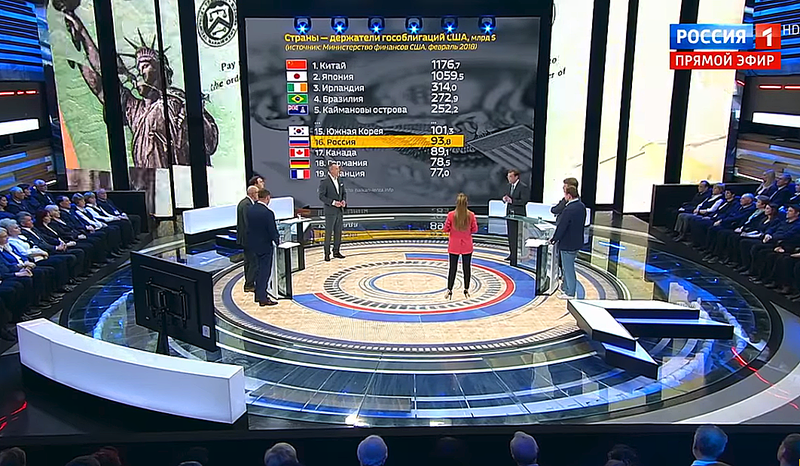 Russian government-controlled state media provided several explanations that purport to explain this course of action. Russia was reacting to U.S. sanctions, including those that have already been imposed and the punitive measures that might be taken in the future, in a possible preemptive move to divest assets before they could be seized. This suggests that Russia might be contemplating further aggressive moves that would warrant the imposition of additional sanctions. 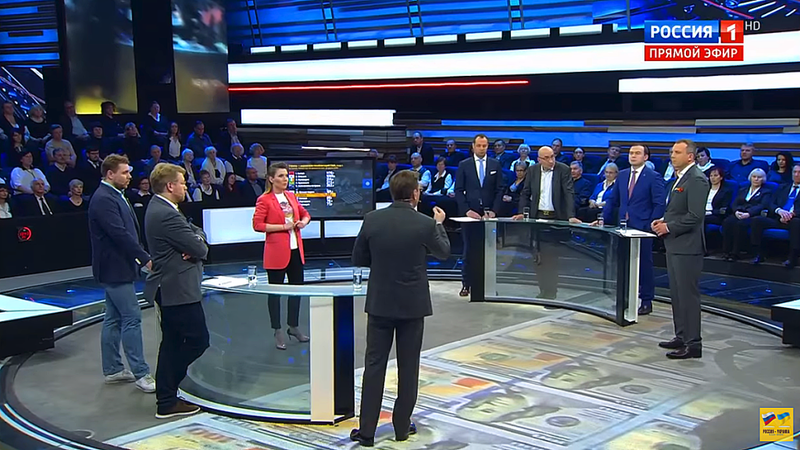 Vladimir Miklashevsky, a senior economist at Danske Bank, commented: “It’s all about the sharp increase in geopolitical tensions and the tightening of U.S. sanctions against Russia. For such a massive sale, we see pure geopolitics: reduction of risks, against the backdrop of the continued tightening of anti-Russian sanctions, in order to avoid a possible development of events under the Libyan or Iranian scenario.” A similar precedent involves the U.S. authorities blocking billions of dollars in assets of the Iranian Central Bank. 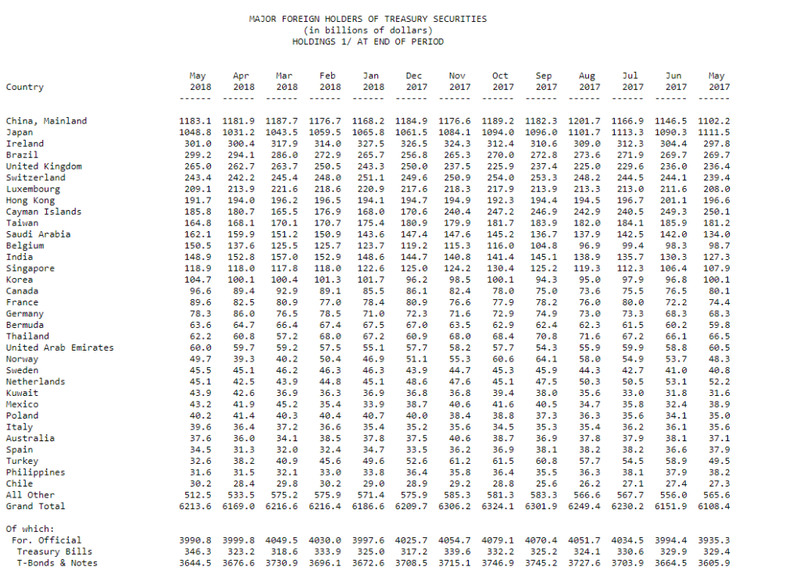 China remains by far the largest holder of U.S. Treasury securities, holding $1.18 trillion at the end of May. 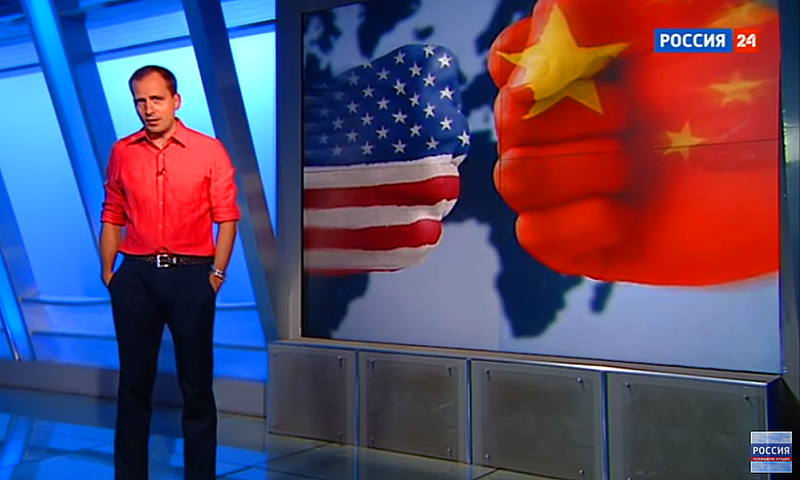 Russian state media openly pondered whether China might sell U.S. treasury holdings en masse, taking in consideration the trade war initiated against them by the Trump administration. It should be noted that in 2008, Russia attempted to convince the Chinese to “join together and sell Fannie and Freddie securities on the market.” The Russians were suggesting a joint pact with China to drive down the price of the U.S. debt and maximize the turmoil on Wall Street. The plot didn’t materialize, but some Russian experts are still hopeful it remains a possibility in the future. Contrary to Trump’s hope of establishing “an extraordinary relationship” with Putin and “getting along with Russia,” the Kremlin and its talking heads continue to see the U.S. as Russia’s main adversary. 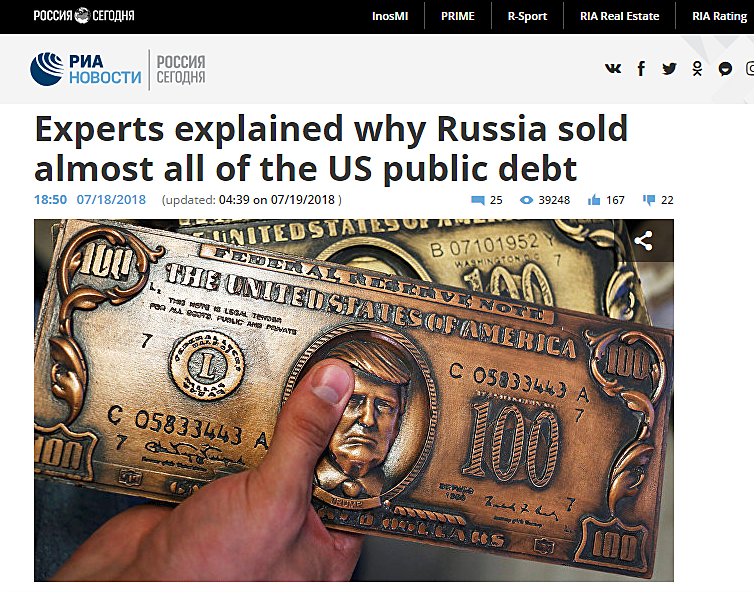 For decades, Russia has been openly hoping for the demise of the American financial system. The head of Russia’s Central Bank, Elvira Nabiullina, admitted that geopolitical risks are being taken into account. She refused to elaborate as to where Russia was moving the funds, freed up after selling off the U.S. Treasury securities. Nabiullina said, “We are pursuing a policy so that the reserves are safely stored and diversified. 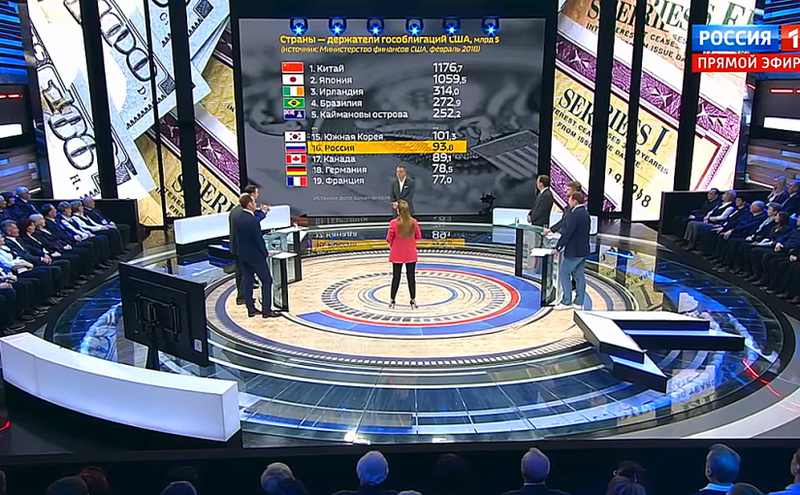 We assess all the risks – financial, economic, geopolitical, while deciding on the placement of funds.” Nabiullina said that the new structure of Russia’s foreign holdings will be revealed with a 6-month delay from the date the action was taken. Some speculate that Russia may have moved its Treasury holdings to the Cayman Islands, with its holdings going up by $20 billion over the past two months. While details remain scarce, the abnormality of Russia’s abrupt liquidation warrants closer scrutiny.